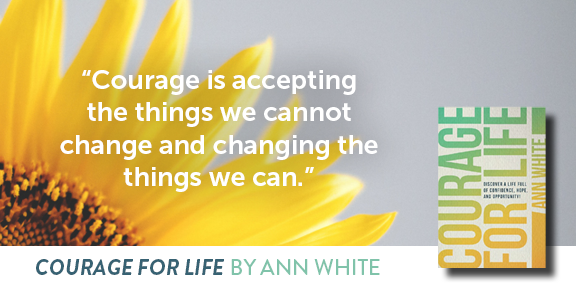 Courage For Life by: Ann White Are you feeling overwhelmed by life–barely keeping your head above water? Don’t despair! You hold a life preserver in your hand. You’re just one choice away from correcting the trajectory of your life. Your journey toward freedom begins the moment you choose to stand up and face your life with courage. 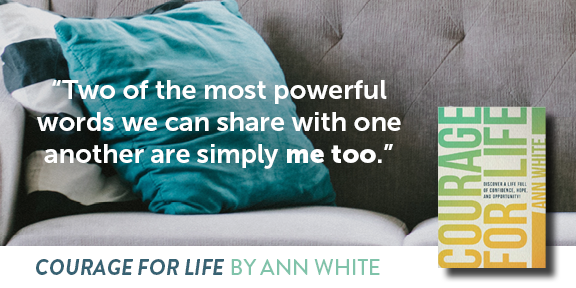 If you have been searching for a way out of wherever you are or whatever you are going through — Ann White provides a path and a process to take the next best step to a better life, the life God has made you for and called you to. Steve Arterburn – Founder of New Life Ministries and host of the #1 nationally syndicated Christian counseling program “New Life Live!” heard and watched by over 2 million people each week. Honest. Transparent. Vulnerable. Courageous. Encouraging. Insightful. These are some of the words that came to my mind as I read my friend Ann White’s book. This book is going to bless and help a lot of people. 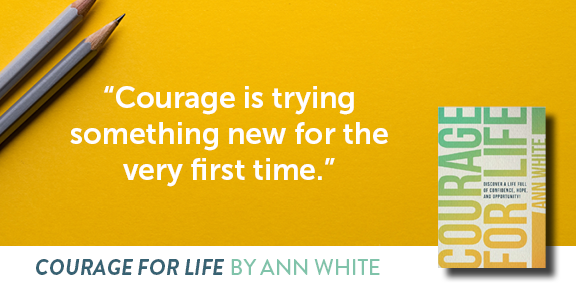 Ann White’s story is an inspiration to those who choose to do the hard things in marriage, rather than take the easy way out. This demonstration of one wife’s courageous determination to trust God’s truth, bathed in His grace, prove trust and obedience can overcome the deceiver who delights in crushing Christian marriages. keeping your head above water? 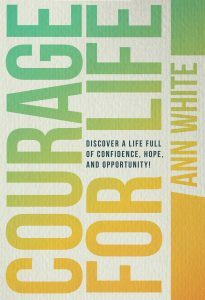 In Courage For Life, author Ann White shares with authenticity and raw emotion the story of how she walked away from a life steeped in dysfunction to a life restored in God’s grace. 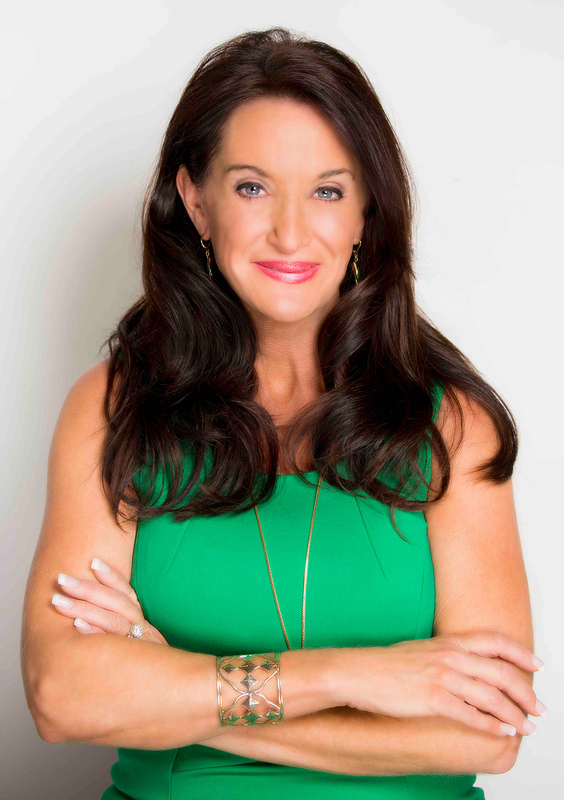 With honesty, kindness, and vulnerability, she provides step-by-step direction and proven guidance through seven intentional, doable steps that will ultimately alter your life, no matter what difficult situation you’re experiencing. Celebrate freedom from your fears. Experience the power and joy of intentional, healthy choices. Replace the guise of perfectionism with authenticity. Say yes or no with firmness and love. Rebuild a healthy marriage and establish strong relationships with family & friends. Stop hiding behind walls of shame and insecurity. 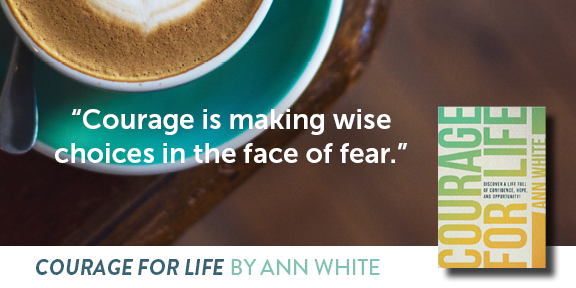 Step courageously into the life God created for you. Ann is an internationally known author, speaker, and passionate Bible teacher. She founded her global ministry, Courage For Life, out of a calling to share with others how God and His Word brought restoration to her life and marriage. Having personally experienced God’s grace, salvation, and the life-changing power of the Bible, Ann’s desire is to extend this same love, mercy, and encouragement to others, so they too may be reconciled to God. Ann is a wife, mother, and grandmother. She and her family reside in Belleair Shores, FL. Ann is a native Carolina girl who met her husband and soul mate shortly after moving to Atlanta in 1978. She founded Courage For Life, out of a calling to share with others how God and His Word brought restoration to her life and marriage. Ann is an internationally known author, speaker, and passionate Bible teacher. For years, Ann’s heart has been burdened for those who need to hear God’s Word and are suffering due to circumstances beyond their control. Having personally experienced God’s grace, salvation, and the life-changing power of His Word, Ann’s desire is to extend this same love, mercy, and encouragement to others, so they too may be reconciled to God. 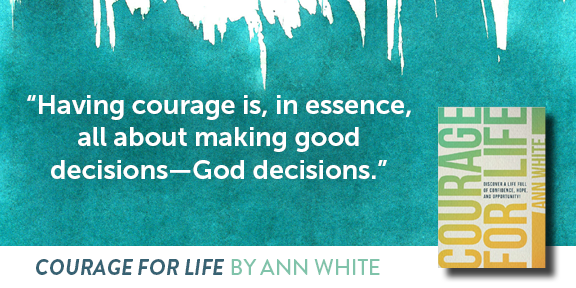 Despite her busy schedule, most days you can find Ann spending quiet moments with the Lord, hanging out with her husband, boys, and their families, writing, reading, enjoying dear friends, and encouraging everyone she meets to embrace COURAGE FOR LIFE. She prays you will join her. 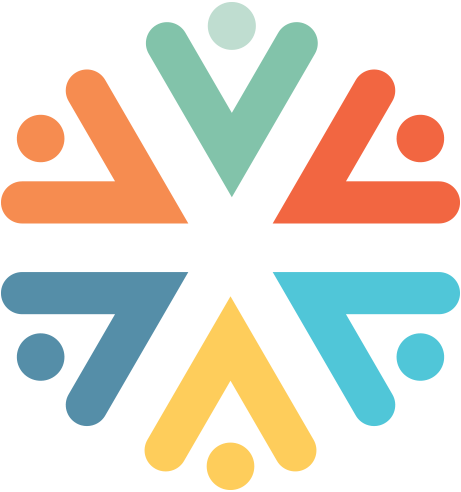 Invite Ann, Jo, and Hope to your next church conference! "There are millions of people living in fear, unable to gather the courage to change their lives. Whether you’re experiencing that fear, struggling with change, or simply stuck in your life or career, this is a must read. " Phil Cooke, Ph.D. - Filmmaker, media consultant, and author of “One Big Thing: Discovering What You Were Born to Do." 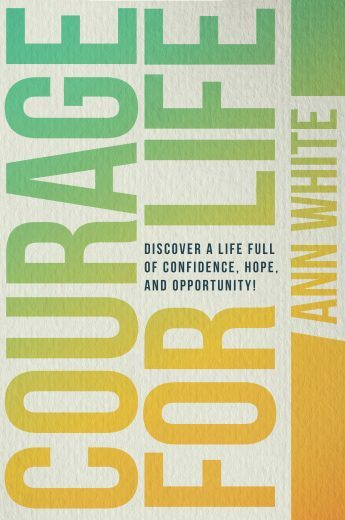 "In a world starving for authenticity, Ann White had the courage to be transparent with her story so that you, too, could walk in genuine courage. 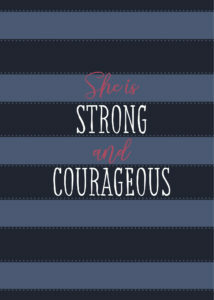 Her book, Courage For Life, will guide you to live in truth with strength and dignity." 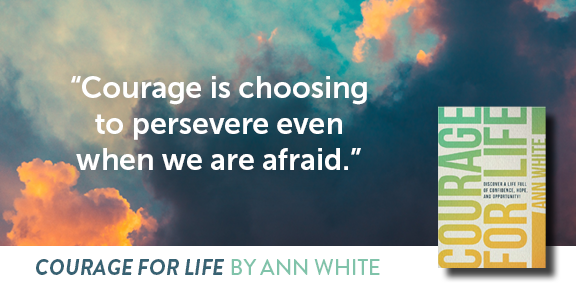 "Courage for Life will keep you spellbound and hopeful as Ann shares her real-life story partnered with some practical steps she learned while allowing God to redeemed her broken life; save her failing marriage; and claim her life fully for His service. " Hover over the Share links below to view all sharing options.